If you see an unsafe situation involving a laser that requires immediate attention, call 911 first. For example, if you see a person aiming laser beams at aircraft or drivers, this should be reported to law enforcement immediately. Later, you may wish to also submit a report to an appropriate agency such as FAA that is listed below. If you are in an organization with a formal safety reporting system, especially one with a laser safety officer, report the incident to the appropriate person. They should take action within your organization, and they should also report to databases such as the ones listed below. This applies to most Department of Defense and Department of Energy laser incidents — report to the appropriate safety person. All aircrews are requested to immediately report incidents of unauthorized laser illumination by radio to the appropriate ATC controlling facility. Reports should include event position (e.g., latitude/longitude and/or FRD), altitude, color of laser beam(s), originating direction, and any other information believed necessary for ATC, law enforcement, and other governmental action taken to safeguard the safety and efficiency of aviation operations in the National Air Space. Event time in UTC, general positional information (e.g., location and altitude). On arrival at destination, all aircrews that have been affected by an unauthorized laser illumination are requested to complete the Laser Beam Exposure Questionnaire. The questionnaire is located on the FAA’s Laser Safety Initiative Web site at http://www.faa.gov/about/initiatives/lasers/ and can be electronically submitted. The questionnaire may also be printed and faxed to the WOCC at (202) 267-5289, ATTN: DEN, or emailed to laserreports@faa.gov. Any flight crew injuries or effects? The above procedures are detailed in FAA Advisory Circular 70-2A, “Reporting of Laser Illumination of Aircraft”. The Aviation Safety Reporting System, which is run by NASA, collects, analyzes, and responds to voluntarily submitted aviation safety incident reports in order to lessen the likelihood of aviation accidents. Pilots, air traffic controllers, flight attendants, mechanics, ground personnel, and others involved in aviation operations submit reports to the ASRS when they are involved in, or observe, an incident or situation in which aviation safety may have been compromised. All submissions are voluntary. Reports sent to the ASRS are held in strict confidence. ASRS de-identifies reports before entering them into the incident database. Dates, times, and related information, which could be used to infer an identity, are either generalized or eliminated. Reports can be submitted online or by postal mail. Details are at the ASRS Electronic Report Submission page and the Download & Print for US Mail page. If the aircraft was landing or taking off, what is the name of the airport? After the FAA has received your e-mail, FAA staff or the appropriate law enforcement agency may decide to contact you if additional information or clarification is needed. The U.S. Occupational Health and Safety Administration requires many employers with more than 10 employees to keep records of work-related injuries and illnesses. Worker fatalities must be reported within 8 hours. Any amputation, loss of an eye, or hospitalization of a worker must be reported within 24 hours. Details are at the OSHA Injury and Illness Recordkeeping and Reporting Requirements webpage. Complaints from workers or their representatives are taken seriously by OSHA. OSHA will keep the information confidential. Details are at OSHA's How to File a Safety and Health Complaint webpage. If there is an emergency or the hazard is immediately life-threatening, call your local OSHA Regional or Area Office or 1-800-321-OSHA. Manufacturers and anyone in the general public may use the Accidental Radiation Occurrence Report form to submit information on any radiation incident or potentially hazardous event. "Radiation" includes visible laser light and non-visible (infrared, ultraviolet) laser radiation. FDA has a page with links to various records and reporting requirements. These include Accidental Radiation [e.g. laser] Occurrences, reporting safety defects, and a list of corrective action plans (product recalls). For the general public, see the page "Report Unsafe Laser Light Shows". 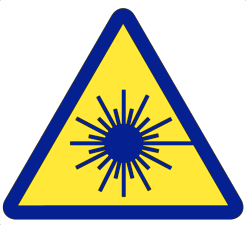 Laser show producers ("light show manufacturers") are legally required to file an Accidental Radiation Occurrence with the FDA, if there was injurious or potentially injurious exposure. Details and links are here. 8. Your verification that the report is true and accurate to the best of your knowledge, information, and belief. When you fill out a report using the online form, you can upload photos of the product, injuries, or damage to property, or provide documents with your report. You can also provide much more information about the product and the incident, such as the product brand and model, where you bought the product, and who was injured. The Food and Drug Administration's MedWatch is used to report adverse events for human medical products, including serious drug side effects, product use/medication error, product quality problems, and therapeutic failures. For purposes of this website (LaserIncident.com), use MedWatch to report problems with medical devices containing or using lasers. These MedWatch reports are used to compile databases such as FDA's MAUDE, listed on the Incident data sources page. Forms are available in downloadable PDF format as well as online. There are forms for healthcare professionals, for consumers/patients, and for manufacturers. To obtain the forms, visit the Forms for Reporting to FDA page. The Consumer Product Safety Commission operates the National Electronic Injury Surveillance System (NEISS). This is a national probability sample of roughly 100 hospitals. Patient information is collected for every emergency visit in these 100 hospitals that involves an injury associated with a consumer product. If the number of collected samples is large enough, the total number of product-related injuries treated in all U.S. hospital emergency rooms nationwide can be estimated. A NEISS-affiliated hospital will automatically report emergency room visits. In addition to reporting at the federal level, in some cases you may also want to, or be required to, report an incident or accident to your state laser or radiological health agency. For example, Arizona and Illinois specific reporting requirements are listed below. Rockwell Laser Industries has a list of State Laser Safety Contacts. 2. Third-degree burns of the skin involving more than 5 percent of the body surface as estimated by the rule of nines. 3. An eye injury with any potential loss of sight. 2. Any incident that triggered a notice requirement in subsections (A) or (B). 4. The corrective steps taken or planned to prevent a recurrence. E. A registrant shall not operate or permit the operation of any laser product or system that does not meet the applicable requirements in this Article. 3) An exposure to an individual that involves perforation of the skin or other serious injury exclusive of eye injury. 2) An exposure to an individual that involves second or third degree burns to the skin. c) Each registrant shall make a report in writing within 30 days to the Agency of any incident for which notification is required by subsection (a) or (b). d) Each report filed with the Agency pursuant to this Section shall include the full name of each individual exposed to laser radiation, including estimates of each individual's exposure, levels of laser radiation involved, the cause of the exposure, a description of any injuries, and corrective steps taken or planned to be taken to assure against a recurrence. e) When a registrant is required pursuant to this Section to report to the Agency any exposure of an individual to laser radiation, the registrant shall also provide to the individual a report on that exposure data. The report to the individual shall be transmitted at a time not later than the date of transmittal to the Agency.